War has a way of disrupting the normal course of growing food and distributing goods, foods, and services. Mass conscription of healthy manpower and diversion of food and goods to the military leaves little for the civilian public. Roads and rail lines (as well as canal and river traffic) have a tendency to become impassable, and refugees crowd cities with hungry extra mouths (Richmond had experienced a tripling of its population during the war due to the influx of refugees) with no commensurate increase in food supply. Marauding armies scour the countryside for sustenance, as in those days (1860-1865) armies did not have the luxury of preserved rations that could easily be stored and shipped as needed. Foragers were a vital part of military units on the march, and these soldiers did not hesitate to strip the countryside of all available food, including farm animals, with no thought to sustaining the local food supply. Peninsula Campaign, map of events up to the Battle of Seven Pines. Map by Hal Jespersen, www.cwmaps.com. The patriotism of the rebellious Southern States in the Confederacy was not so apparent when it came to the choice of eating or starving. Farms that had been ransacked and their animals killed by foraging soldiers left the rural people with no extra food to send to cities. Croplands were destroyed by battles and troop movements, and the Union blockade of Southern ports kept imports of food to a minimum. Slaves processing tobacco in 17th-century Virginia, by an unknown artist, 1670. Another often overlooked factor was the scarcity of salt in the Wartime South. Salt was the major food preservative of the Civil War era, and the diminished lines of communication and supply drastically curtailed much of the distribution of this vital need. The Union blockade again became a major impediment to feeding the Confederacy by limiting salt distribution across the South. Union capture of Confederate territory salt mines (notably in Louisiana) took away major sources of Confederate salt. Another aggravating factor causing people to riot was the inevitable inflation in the prices of food. Refugees and poorer classes of people could not afford the outrageous prices demanded by those that had food to sell, creating frustration that could only be expressed through violence. Virginia State Capitol, used as the Confederate Capitol. To the left is the Customs House, used by the Confederate Department of the Treasury and the offices of the President and Vice-President. Photograph by Berean Hunter. Despite at least 5000 women (mostly women, that is) looting and destroying property, and the Virginia Militia being summoned to put down the riot, no deaths were reported, an amazing fact when you know the women were heavily armed with implements such as axes, knives, and other tools. One woman reportedly got her fingers chopped off by a storekeeper as she reached through a broken window to help herself to some goods. The main instigator of the riot in Richmond was identified as Mary Jackson, age about 34 at the time, a peddler and “huckster” who had a son serving in the Confederate Army. Jackson went about town recruiting women and inciting the violence that followed. Jackson and others were arrested and put on trial, but court records later burned along with much of the city of Richmond later in the war, so we do not know what sort of sentence the arrestees received. We do know that the mayor of Richmond responded to the scene of the worst rioting and formally “Read the Riot Act” to the mob and that President Jefferson Davis (of the Confederate States of America) also went to the scene of the riot to plead with the rioters to stop rioting. Davis reportedly emptied his pockets of whatever money he had with him and threw it to the mob, saying, “You say you are hungry and have no money; here, this is all I have”. Questions for Students (and others): Were you aware of the Southern Bread Riots? Are starving people morally justified in rioting and looting? Please let us know in the comments section below this article. Hurt, R. Douglas. Agriculture and the Confederacy: Policy, Productivity, and Power in the Civil War South. The University of North Carolina Press, 2015. US Naval Academy. 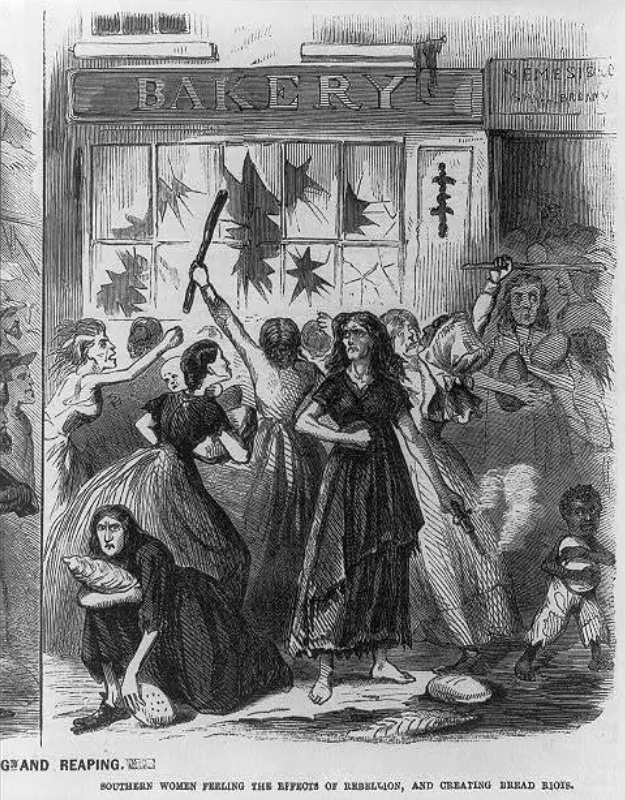 The Richmond Bread Riot of 1863: Class, Race, and Gender in the Urban Confederacy. CreateSpace, 2014. The featured image in this article, bread riots in Richmond, is in the public domain in its country of origin and other countries and areas where the copyright term is the author’s life plus 70 years or less. Previous ArticleApril 1, 1970: The AMC Gremlin, Another April Fool’s Joke?